Balding, and heavily bearded. Favors open necked suitshirts to show off his chest tattoo. Heavyset, formerly muscular, but starting to go to seed a bit. Has gotten out of the rough and tumble of straight smuggling, and is trying to break into weapons R&D a bit more. Still has good connections though. Late 40’s. His parents emigrated from Armenia to Israel, and he converted to Judaism while growing up there. Due to his connections with the Vory V Zakone from his smuggling days, he landed in Israel during the exodus from Mars. 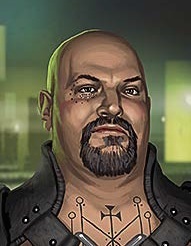 He’s gotten in pretty deep with the syndicate, working on custom smuggling containers and new weapon mods.